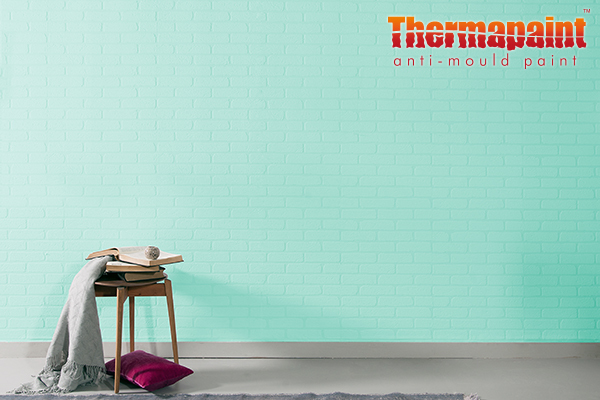 Premium dual-action anti-mould paint kills mould, improves air quality, reduces condensation and saves energy, all in one! 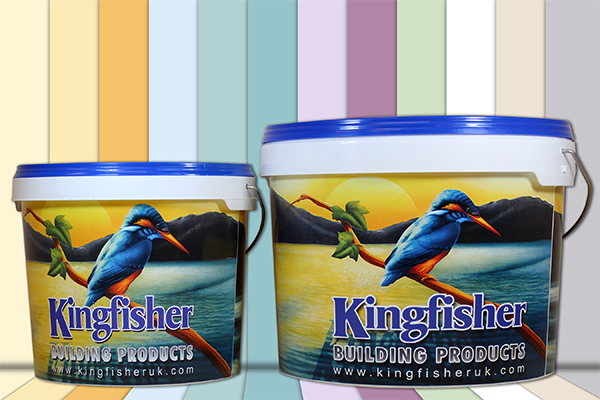 This mould resistant paint is perfect for kitchens, bathrooms, bedrooms, living rooms and more. 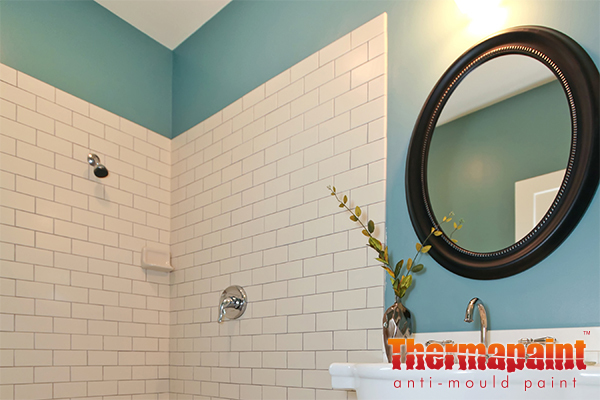 Anti-Mould Paint (Thermapaint) is an outstanding DUAL ACTION insulating paint. It is the only paint that combines both microsphere technology and our latest anti-mould paint chemistry to stop re-growth. Our anti-fungal paint is low odour, fully washable and when fully dried out, immune to the effects of condensation. Companies and project managers often worry about damp, mould and condensation issues due to its expense. 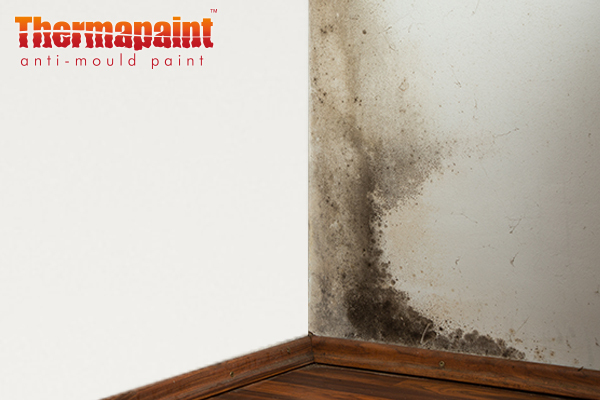 To combat these problems, you need a high-quality mould proof paint to contest fungal growth and mildew. Our anti-fungal paint can last for approximately 6 years. After that the effects can begin to slow although usually rooms are repainted within 6 years of its previous coats. Black spot mould growth is a common problem. It not only leaves ugly black staining on internal paint finishes. The airborne fungal spores have been proven to aggravate respiratory complaints associated with poor air quality, including asthma. 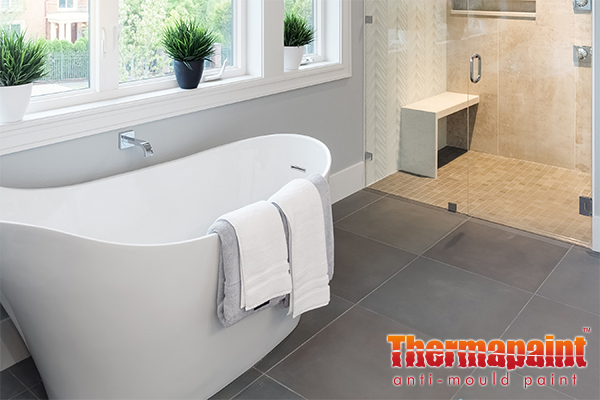 Thermapaint Mould Proof Paint is a significant advance over existing anti-fungal paint. This is because it is the only DUAL ACTION energy saving anti-mould paint. There are many advantages that our mould resistant paint provides. 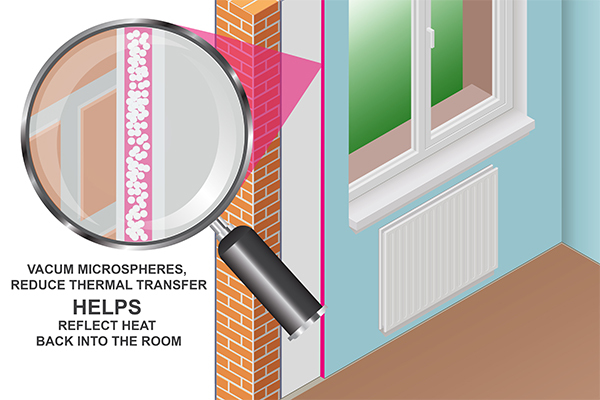 Its insulating properties will help to combat heat loss. That will help to reduce energy costs, saving you money on your heating bills. 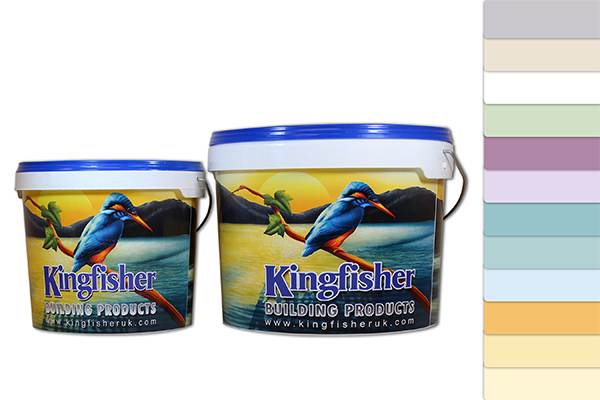 On interior walls and ceilings, Kingfishers insulating paint forms a thick layer that prevents heat from leaving. The mould resistant paint robs black spot mould of the moisture it needs to grow. By warming the wall surface, it will help to reduce condensation by up to 96%. It then forms an active-film fungicide to deter further infestation. Our anti-fungal paint is especially effective on walls with cold spots which typically occur on external walls. This also causes an energy saving, insulating effect as well as lowering condensation. Thermapaint Mould Proof Paint is widely used by private landlords and social housing providers to treat persistent problem areas. It can be applied by roller or brush like any normal emulsion. 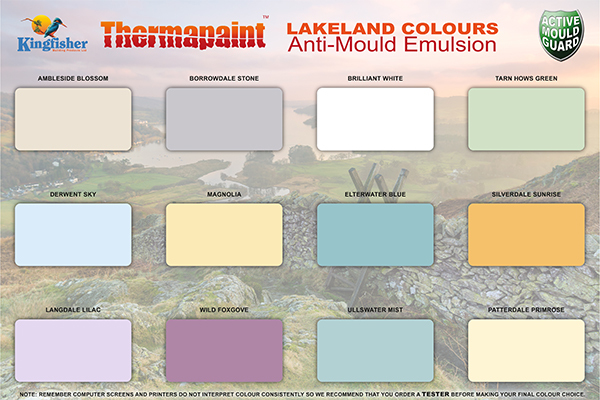 With an attractive array of Lakeland Colours now available, there are a wide range of options. Pre-treatment: It is essential to pre-treat existing black spots with Kingfisher "Mould Cure" fungicidal wash. Note: Remember computer screens and printers do not interpret colour consistently so we recommend that you order a tester before making your final colour choice. "Indoor conditions - Mould or damp, house dust mites and chemicals in carpets and flooring materials may trigger asthma." Prompt delivery (next day). 5 litre container was much lighter in weight than standard emulsion - must be the effect of all the microbeads. Easy to apply. Two coats have given a great finish. Only time will tell how effective it is in reducing condensation and mould! Mould on one Main Bedroom Wall behind Bed. Too early to tell if it works. Goes on well, I found it better with a roller than brush. Definitely requires two coats for best results. Colour Magnolia which was pleasing, not too yellowish. As said High Hopes as have tried other products but mould did return.